We Show You How to Get to Baller Status Starting With Just the Lint in Your Pockets! You've seen it on TV: thousands of poker players descending on Vegas each summer for the World Series of Poker Main Event, all of them either buying in direct for $10,000 a piece, being staked by friends, or satellite-ing in visa online or live qualifiers. What most - if not all - of them have in common is that they built up their bankrolls from (mostly) humble beginnings (even Phil Ivey, even if the last time he boasted a miniscule bankroll was in about 1982). So, what if you're a keen player but are a bit short of the readies? How can you effectively build up a poker bankroll from scratch and what happens if things go wrong? With so many possibilities for online poker players in 2019 there's no reason not to establish a fairly sizeable roll from a meagre starting point - you just need to know where to look. OK, so you're starting the needle at zero - how can you get your hands on some dollars without whipping out the credit card and clicking the 'DEPOSIT' button? Online freerolls should be your first port of call. All sites offer freeroll tourneys to players, especially major poker rooms with plenty of cash to splash around and the new sites cropping up in 2019 who are after lots of new customers. The prize pools on offer can vary - anything from $50 up - and the bigger daily freerolls can often attract thousands of players at the major sites, but they're certainly a great way to hone your skills and earn some bucks. Just bear in mind that time it takes to play these free-to-enter tournaments; playing for a few hours straight isn't worth it if you only come out the other side with a few dollars to your name. While the majority of freerolls are in Texas Hold'em, scout around for freerolls in other disciplines like Omaha or Stud. These are great ways to learn a new game and also earn some quick money. There won't be too many entrants - at least, not compared to a Hold'em freeroll - and often times the players will be terrible. Learn a few basics in a new discipline and take advantage. Even if youÂ’re an experienced poker player, itÂ’s worth joining a few poker forums online Â– theyÂ’re great places to learn tips, find out the latest gossip and also take advantage of some exclusive freerolls for members of the forum. Forums are always doing deals with poker sites to entice new customers to their rooms, so jump in for free and play freerolls that will undoubtedly have much fewer runners than a site-wide freeroll. Here at CardsChat, we have some of the best and most generous private freerolls of any forum on the net. 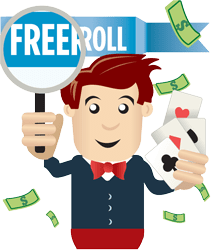 Check out our freeroll calendar and also get involved in the forum - Freeroll Passwords for PokerStars, 888 Poker, Party Poker & more. Also check out print magazines. To help promote traffic to new sites or existing sitesÂ’ major events, magazines will run password-protected freerolls which will often carry a prizepool of around $2,000 or the equivalent in tourney tokens. YouÂ’ll have to subscribe to the magazines or find passwords lurking on poker forums on the net. OK, so let's say you have had a little success in the freerolls and there are a few dollars sloshing around your online account. What now? If youÂ’re a traditional cash game player youÂ’ll have a hard time finding free-to-enter games, but thereÂ’s no reason you canÂ’t bulk out that bankroll by hitting up the micro-stakes tables. If you live in a county with legalized online sports betting, try out those firms' poker rooms Â– they will often be full of players who've transferred some of their sportsbetting funds to the poker tables, often to 'try out' the games. These are ideal opponents for winning some quick, easy cash. Even better - try out some of the new 'fast foldÂ’ cash games doing the rounds online at the moment. They basically work by changing your table as soon as youÂ’ve folded, making it possible to get in a lot more hands in a shorter space of time, and if you play sensibly, grind a bankroll much faster. Some sites are moving towards even faster action, with cash games featuring limited 10bb buy-ins and only pre-flop action allowed. Some argue this is taking the thinking out of online poker, but it certainly adds an added 'gamblingÂ’ element to the game. Are you a tournament player traditionally? ThereÂ’s no need to worry. There are plenty of added-value tourneys online to get more oomph from your dollar. Look for the 'Guaranteed PrizepoolÂ’ tournaments online Â– most sites have them. These will guarantee a certain amount of cash, regardless of how many players enter. Do your homework here Â– some sites with bad levels of traffic will still guarantee prizepools but will rarely meet them Â– this means more 'overlayÂ’ and more added value for you, the player. It doesnÂ’t take long to get to know who has the best guarantees, and when theyÂ’re played. ItÂ’s worth keeping notes on what days and what sites are best. Online Sit 'n Gos are perfect if you have only got an hour or two and want an online fix. TheyÂ’re also great for winning some quick cash for your burgeoning bankroll. Sit 'nÂ’ Go entries start at just a few dollars, with top three normally paid out. Double or Nothing SNGs, meanwhile, start the action with 10 players but stop as soon as the field is reduced to 5, with everyone left simply collecting 'double their moneyÂ’. While thereÂ’s little incentive here to go for the win, they are good for guaranteeing an easy double-up as long as you play solid, tight-aggressive poker, and multi-table. If you have a little extra bankroll at your disposal, the iPoker network offers Jackpot Sit & Gos where you get rewarded with a big progressive jackpot prize if you can achieve a certain number of consecutive wins. They only start at $2, are 6-max, and can be a lucrative way of hitting it big for a relatively low outlay.ThereÂ’s sometimes a secondary jackpot up for grabs as well if you come at least 2nd in a series of Jackpot SNGs. Hit a certain target and you can begin to make the online poker sites work even more in your favour by tapping up some welcome bonuses. All online poker sites offer 100 percent bonuses (or better) to new customers making a first deposit. They will all offer varying monetary levels but earning 100 percent up to $400 or $500 is not unusual. How do they work? Sign up for a new account, make a deposit and the money will be matched by the site as long as you 'play throughÂ’ a certain number of tournaments or cash game hands over a designated time period. Trigger the bonus and the cash will be paid back to you in increments. While bonuses arenÂ’t suited to everyone they can be a good way of bolstering a bankroll if youÂ’re planning on playing a lot of online poker. Whatever level youÂ’re playing at Â– and even if you only have a few dollars to your name Â– youÂ’ll need to exercise sensible bankroll management so you wonÂ’t go busto if things donÂ’t go your way. Once youÂ’ve got past the freeroll stage and have a bankroll, the general rule of thumb is to have a bankroll of 20-40 times the maximum buy-in at the game you want to play. So, for example, if your choice of game is $0.05/$0.10 No Limit HoldÂ’em with a 100bb max. buy-in, that means playing with a bankroll of 20-40 lots of $10, or $200-$400. And thatÂ’s just for single table. With tournaments, a buy-in of 5 percent of your total bankroll is recommended, so a $5 buy-in for bankrolls of $100 is standard. This gives you a sufficient safety net if things go wrong. Many players donÂ’t play with a proper bankroll strategy Â– if any strategy at all Â– and thatÂ’s a key reason why they go bust. Meanwhile, others like to 'take a chanceÂ’ and play way above their bankroll in games that have far too big a buy-in or limit. Poker is a long-term game, and wins should be a slow process just as losses should make small dents in your finances. Finally, get into the habit of having a separate bank account for your online poker. 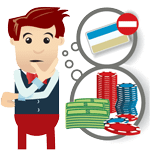 That might not seem too important when playing at the low levels, but if you manage to build up a substantial bankroll from scratch itÂ’s good to have a separate pot of funds from which to withdraw from and deposit to. Before 2000 WSOP champion Chris "Jesus" Ferguson became a pariah for his involvement in the scandals at FullTilt Poker, he embarked on a famous bankroll challenge. Ferguson started off playing freerolls on his sponsorÂ’s site Â– FullTiltPoker.com Â– and when he had a small bankroll started to move up the levels. His aim? To make $10,000 from a starting point of $0.00. There were strict rules, of course: Jesus never bought into a cash game or SNG for more than 5 percent of his total bankroll, except the very lowest buy-ins ($2.50 or less) where he could buy straight in regardless of roll. As for MTTs, buy-ins were restricted to 2 percent or less of his bankroll at any time. If playing cash games, Ferguson would sit out if the pots got too big for his available bankroll. Eventually, after some 18 months of trying, during which Ferguson slowly moved up the levels, he finally reached his goal of $10,000. A sensible bankroll management approach was key to him succeeding. Think you can do the same? Why not try it for yourself. Set yourself a target bankroll, give yourself a time limit, and choose your games Â– then blog your progress or take to Twitter to tell everyone how youÂ’re getting on. YouÂ’ll be surprised at how the challenge makes you view your own game and your own attitudes to building a poker bankroll.